Here is a Then & Now comparison. The same view taken 74 years later by Ron Ridolph. Dave Russo: This is the exact location of the LIRR Mineola bridge as it looks now, looking south. Knowing that the LIMP followed the path of where the building is right in front of us, the remaining/existing posts to the east are actually pretty far away from the actual LIMP. I hope everyone can indulge me in telling a simple story. Starting in the 1970’s I would begin to run across the ruins of the old parkway through the backyards of my neighbors, or the road behind Albertson Park. Eventually us kids even explored the private property off Old Searingtown Rd, and I was becoming fascinated. In 1978 my friends and I found the LIRR bridge in Albertson. I was hooked and wanted to follow the old road as far as I could. But heading east I lost it going into the back of Wheatley Hills Golf Club. In the spring of 1983 I was hired at the club as a busboy. Within weeks I was asked to go clean up after some type of official board meeting in an upstairs private room. It was there I was able to view photos of the LIMP turning south and crossing Hillside Avenue. It was like finding gold. On Sunday I woke up early and went to St Aiden’s mass by myself. Afterwards I began exploring. I was so amped up about following the ROW south, I did not even notice the ruins in Carle Place. But as I approached the LIRR Mineola line I could see the old bridge. I could not get to it from the north. Instead I rode my bike all the way to the south. I Climbed out on a ledge at the back of the parking garage. Avoided barbed wire. Ducked under very large power lines, and reached the base of the bridge. There was no land fill on either side of the bridge. Just a free standing bridge. At 16 years old, I climbed the wall with ease. I felt in awe standing on top of the old bridge. It was beyond a thrill. I felt like I had really found something special. On the north end of the bridge the old pavement extended beyond the bridge. But there was no land under it. The blacktop pavement and the cement extensions had separated. The cement sidewalks, as I called them, sagged less then the rest of the road. It was surreal. I clearly remember the side steel walls were considerably lower than those at Albertson. There I could lean up against the wall, and feel safe looking down the tracks. Here I was afraid to go near the wall. It was quite a drop. I did not feel safe. There was at least one pot hole with exposed rebar big enough for my foot to fall into. But that was the least of it. The first moment I stood up on top, I felt a wooziness. Was it my imagination, or did this bridge sway? The Albertson overpass always seemed as solid as the day they built it. To test my theory, I jumped high and let myself land hard. Wow. There was no mistaking it, the bridge moved. Moments later a westbound train passed below. The conductor locked eyes with me, and we held that look until the train passed below me. The bridge shook. I knew it was time get off the bridge. A few weeks later my mom was shopping at a store in Carle Place, and I was waiting in the car with my dad. I coaxed him. “Come on, drive down this road, I want to show you something.” We drove down Voice Rd. All the way to the back corner of the parking lot. As close as we could get to show him the old bridge. And as we arrived it was clear to see. There was a crew working to remove the bridge. Soon it would be gone forever. And little did I know, at this point, the Albertson bridge was already gone. I immediately felt so fortunate I found the bridge and that I was able to climb on it before it was demolished. To this day, I feel the same. Very cool, Frank. You can actually see the faded white line in the middle of the pavement circa 1983. Whoa Joe, there’s nothing simple about your story of the LIMP. No doubt both you and the conductor’s hearts were racing! Thanks for sharing. What 16 year old wakes up on a Sunday morning and goes to church alone??? LOL. Great story Joe. Awesome that you found this passion at such a young age. Now if you only took pictures!! A wonderful childhood experience. Thanks Joe for sharing! As I read on I can visualize myself on that bridge. Yes that woozy feeling. What strikes me most about this bridge is that same low railing protection for autos, also found in Central Ave and Westbury Ave bridge in Levittown. Thankfully no incidents ever occured with those larger sized wheels of the day. I believe the low volume’d traffic of Motor Parkway helped prevent such mishaps. But considering the overall design of the parkway, which included banked curves, guardrails, over and under bypasses, exit and entrance ramps, paved roadways (rare for the times), I believe they did pretty good for a first time attempt. Also amazing Joe, is how you just missed Mr. Ridolph snapping away on top of the bridge, while you’re in the car with your dad, waiting for Mom. He was up there! I love this stuff. Thank you guys for recording this historic event of the bridge! Great story, Joe! 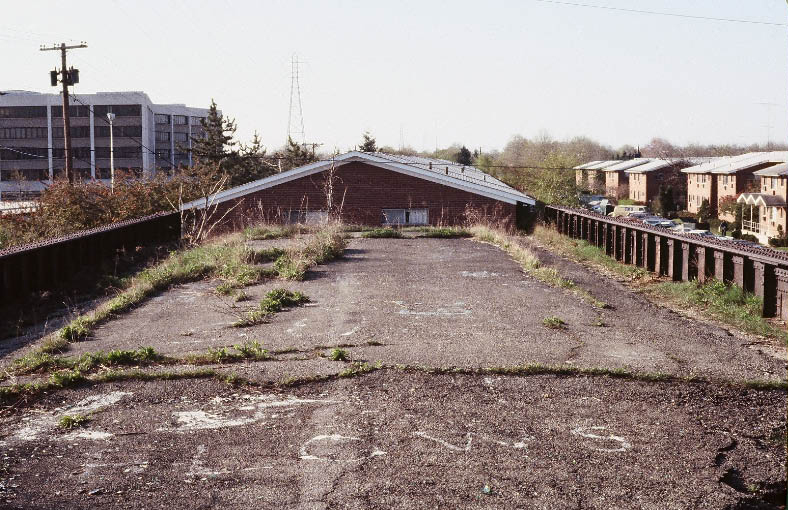 It reminds me of the day in 1971 when the kids on my block at Mitchel Field located the remnants of the Central RR Bridge that still stands today in the woods inside the transition loop from Eastbound Stewart Ave. to Northbound Meadowbrook Parkway. We thought we had stumbled on some great archaeological find that was sure to make the newspapers! I rode my bike home hurriedly to get my Dad and show him what we’d found. Tremendous memories , thank you for sharing with all of us. I have had similar “I was there” memories at other auto related locations , and those locations as well are now no longer there. ( I walked around the abandoned factory in Syracuse , NY where the Franklin car was built , and was there to see it demolished with explosives and caught it on movie film in the 1970s) . Moments in time captured forever in memories that are most important to share. The apartment complex in the photo, would that be Eagle Rock Apartment formally known as Fairhaven Garden Apartments on Old Country Rd. with the office building next to it 800? Updated: Dave Russo added three 2016 photos of the location. Mark – Eagle Rock is correct, just west of the 800 Flowers building. The parking lot Vanderbilt Drive is the approximate LIMP RoW. 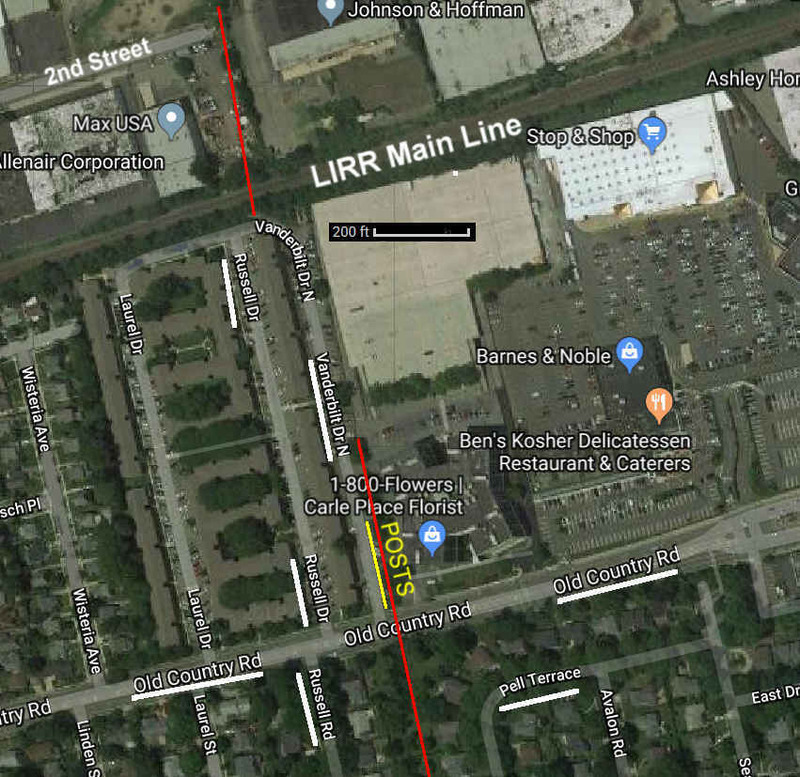 Sam – Tricky section, I believe it went like this; After crossing the RR bridge southbound on the LIMP, the parkway didn’t follow the street grid and headed slightly eastward towards Vanderbilt Drive. Soon after the descending ramp there was a slight right bend before reaching Old Country Road, aligning the LIMP with Vanderbilt Drive. 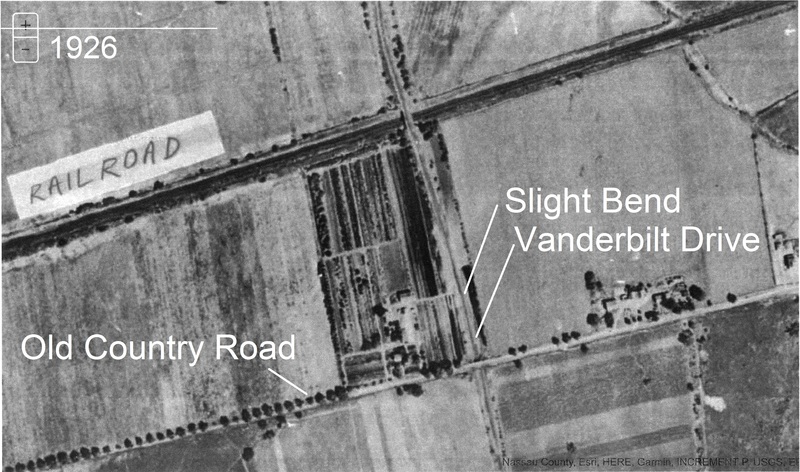 The right bend can’t be seen in Robertson’s 1909 photo but visible in the aerial sending to Howard. I’ve seen similar distortions at other locations: Just east of Commonwealth Blvd bridge, and just north of 73 Ave bridge in Fresh Meadow. Sam, regarding the alignment of the Parkway after crossing over the LIRR southward. 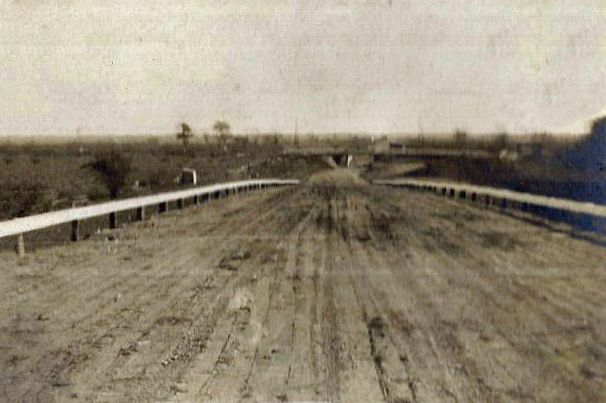 The Parkway was required to shift the roadway westward as it approached Old Country Rd. in order to align with the Parkway’s r.o.w. south of Old Country Rd. which was only 50 feet wide and immovable. The Parkway preferred a minimum of a 100 foot wide r.o.w. They were fortunate that the Garden City Company accommodated them at all. That area already had a sub-division laid out. 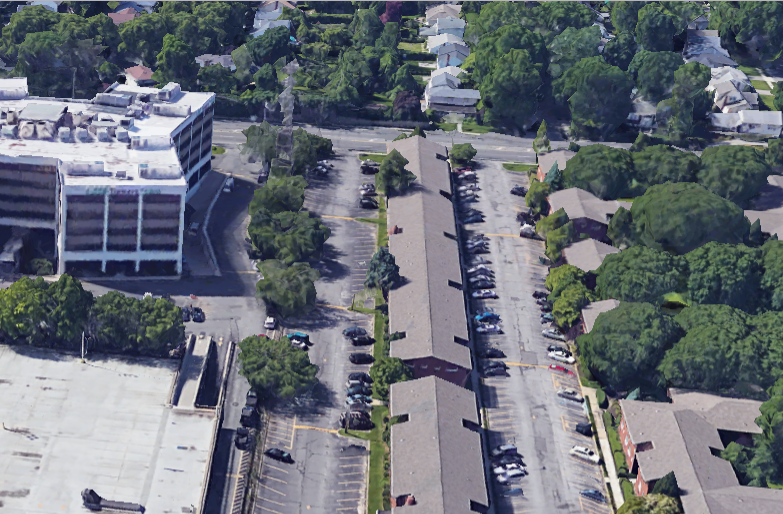 The Garden city Company took 25 feet from the rear of lots backing up to each other in order to accommodate the Parkway r.o.w. thru this area. As part of the deal, the Parkway had to built the bridge abutments that we call the Mayan ruins. I believe a map of the original sub-division exists. Bob - Your neighborhood on Chaffee offers a rare and original stretch of Motor Parkway roadway nearby in the backyard of 121 Sigsbee Ave.
Sam - Enjoy the map and use at will. It’s accessible to everyone. Supposedly it can be embedded onto a web page.as well. I’ve seen an embed code somewhere. On top of the left pane, click the down arrow to expose the map key. By clicking any item on the left pane or the map reveals details, links, and photos. The RoW line in Queens, Nassau, and western Suffolk was derived from overlaying old aerials onto Google satellite images. It’s as close as possible using the crude tools of today. Aerial photographs can vary in accuracy as well. From Dix Hills to the lake I just followed Rt 67, except where bridges, toll structures, and other interests were once located. Those areas were overlaid for accuracy as well.